Which really just means cheesy potatoes….with fried eggs and bacon. 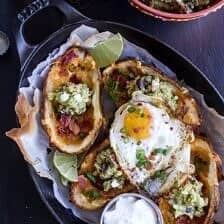 So I know that potatoes skins are nothing new and that probably just about everyone knows how to make them, BUT, I feel like the week before the Super Bowl is the perfect time to remind you all that you really need to make some potato skins!! 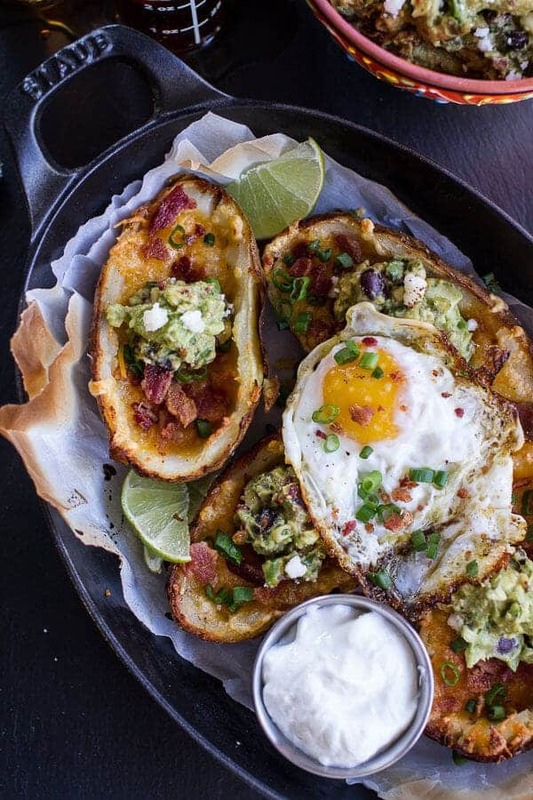 Preferably these fully loaded potato skins with chipotle southwest guacamole. You all know that “loaded” to me obviously means triple the cheese. Plus spicy, smoky guacamole and a fried egg. What, eggs? Yep, especially these crispy, olive oil fried eggs, which honestly make everything that much better. And if you think about it, these skins are kind of like your own personal giant nacho. Only instead of chips we have crisped up potato skins, which dare I say are a million times better than any old nacho chip. But then again, I kind of love cheesy potato skins. Growing up my dad would make them all the time, but instead of eating them as a side or appetizer like normal people (we are far from normal…thinking you already know this by now though), we ate them as a meal. Back then, I never thought this was at all weird, it was just one of dad’s dishes. Of course I’ve since come to realize that potatoes skins are more of an app or side. Thing is though, we still eat potato skins for dinner all the time. No need for anything else in my book. When we were kids, we totally just had the skins straight up. Meaning cheese and potatoes…with loads of bacon bits for the boys. 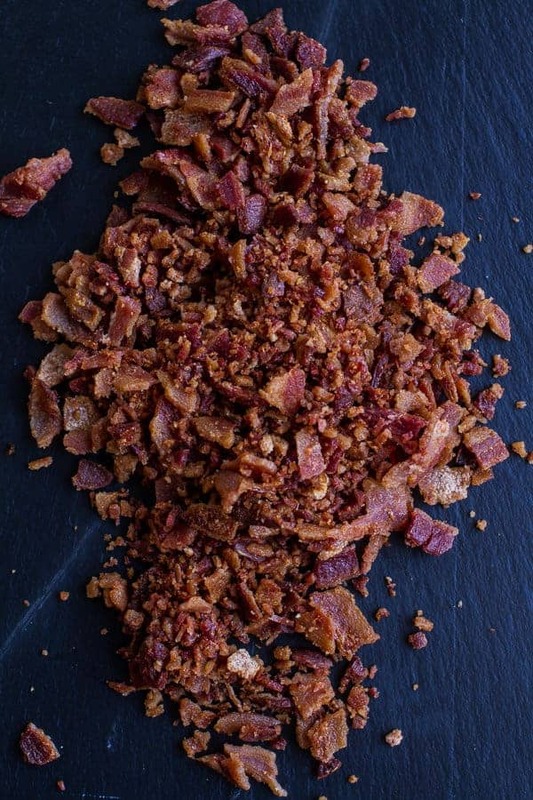 I never ate the bacon bits because they totally freaked me out. The boys still love them, I am still totally freaked out. I mean maybe the real bits (which we now make) but back then they used to eat those fake Bac’n Pieces with ingredients I can’t even pronounce, and Red die #40 – so gross! Today though, I loaded these skins like I would nachos. Full of cheese, topped with REAL bacon, chipotle southwest guacamole, some fried eggs and even a little buffalo sauce if you are into it. They definitely have a little spicy Mexican flare to them. Yeah! 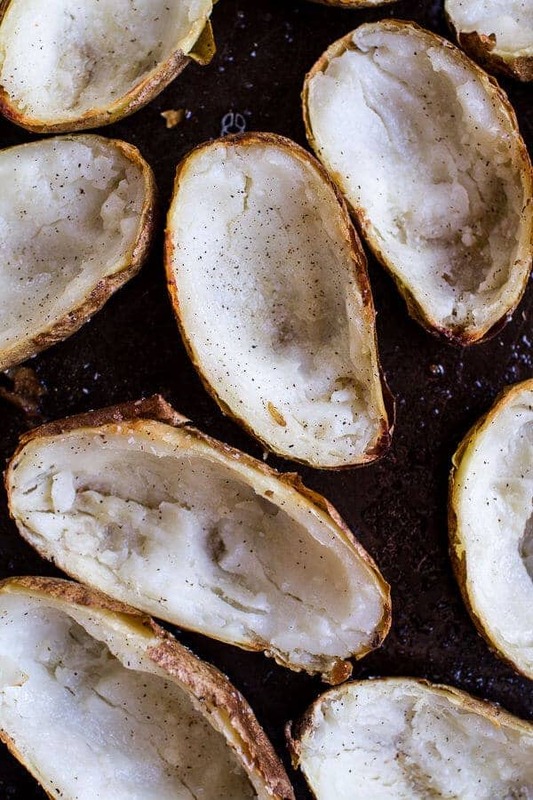 Oh, and my secret to a freaking awesome potato skin? Butter…a little more butter… salt and cheese – lots of cheese! The three ingredients that can almost never fail you. Also, if you wanted to make these a little early, say tonight or tomorrow? I think that’d be a pretty good idea. Preheat the oven to 400 degrees F. Scrub the potatoes clean then prick all over with a fork. Bake the potatoes for about an hour or until the potatoes are cooked through and give a little when pressed. To cook the potatoes in the microwave, rub all over with olive oil and cook on the high setting for about 5 minutes per potato. I have found that I prefer baking the potatoes in the oven and think oven baked potatoes are easier to work with. While the potatoes cook, fry the bacon in a skillet or on a griddle until crisp. Drain on paper towels, allow to cool and then crumble the bacon. To make the guacamole, mash the avocados in a medium size bowl (I left mine pretty chunky, but go as chunky or as smooth as you like). Add the cilantro, jalapeño, lime juice, chipotle chile in adobo + adobo sauce, cumin, salt and pepper. 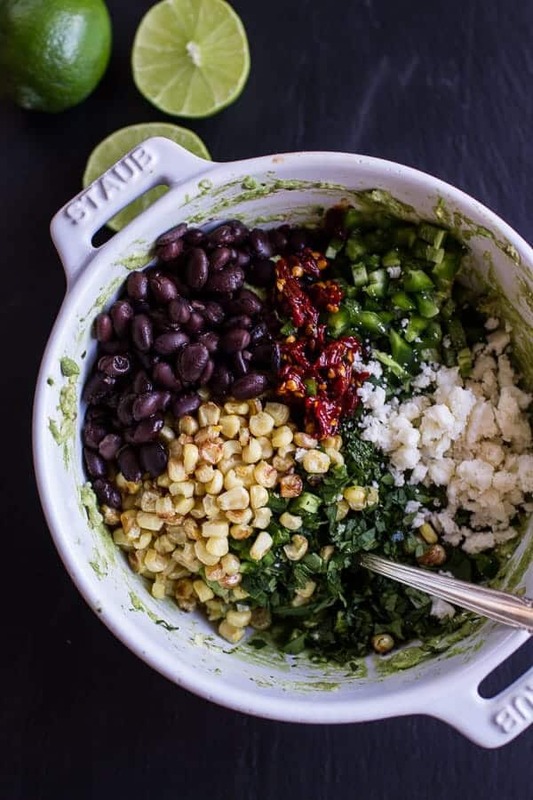 Stir to combine and fold in the roasted corn, black beans and cotija cheese. 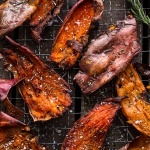 Remove the potatoes from the oven and increase the heat of the oven to 450 degrees F.
Allow the potatoes to cool enough to handle and then cut in half horizontally. Use a spoon to carefully scoop out the insides, reserving the scooped potatoes for another use and leaving about 1/4 of an inch of potato on the skin. Brush or rub both the inside and outside of the skins with melted butter. Sprinkle with salt and pepper. Place in a roasting pan, bake for about 10-15 minutes or until crisp. Remove from oven and divide the cheddar cheese among the shells. Sprinkle with bacon. Place back in the oven and broil for 1-2 minutes or until the cheese is melted and bubbly. Remove and sprinkle with green onions and any remaining bacon. Serve warm with guacamole, yogurt and fried eggs. I mean, you gotta do a pre game-day trial run. Practice makes perfect! Wow! 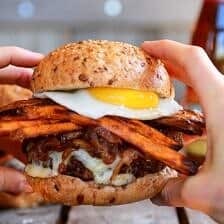 The fried egg pushed me over the edge 🙂 We don’t watch the Super Bowl here in the UK, but I’m going to pretend we do and make these this weekend! Haha, well, we don’t all watch the Super Bowl over here either! Maybe just the commercials? If that. But we’ll certainly still snack. “Crisped up potato skins” you are speaking my love language. Smoke chipotle Guac. My heart swoons. And I love it when you talk about your dad and siblings! I’ve never made these but after seeing the pictures I just might have to. WHOA! 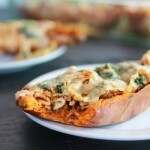 You have to make potato skins, you will love them! 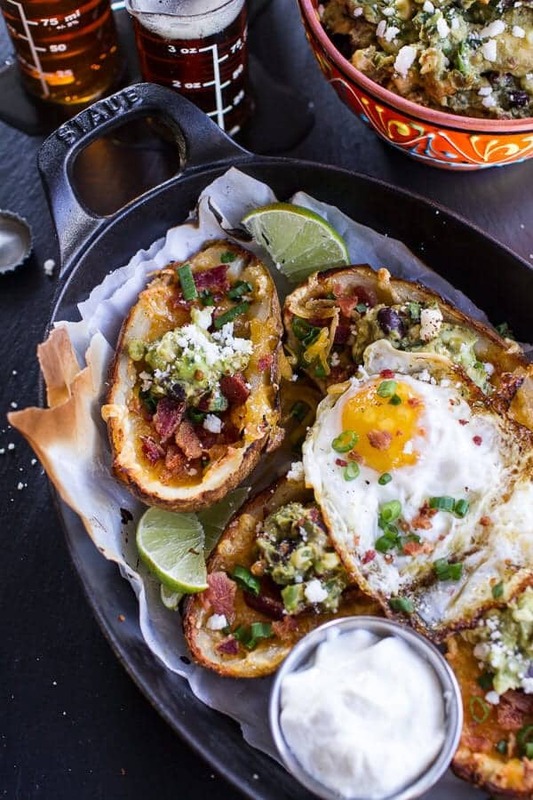 Love Potato skins and with an egg on top…pure genius! Sounds like tomorrow’s dinner. OH my gosh! Do you want to bring these to my house for superbowl. I love potato skins and ate them a ton as a child. It was always the appetizer my sister and I chose when we went out (which was pretty much never!) so they were a special treat. These look amazing! I’m salivating right now. 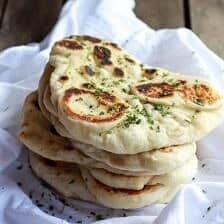 I’d love to make these for dinner. Just wish we had chipotle chiles in adobo sauce where I live, in Australia. I’m American, and I really miss all of the Mexican food from back home. I make what I can, at home, though. Oh no! That is so sad, do you have chipotle chili powder by chance? That would work too! Is it wrong to want these right now for breakfast? 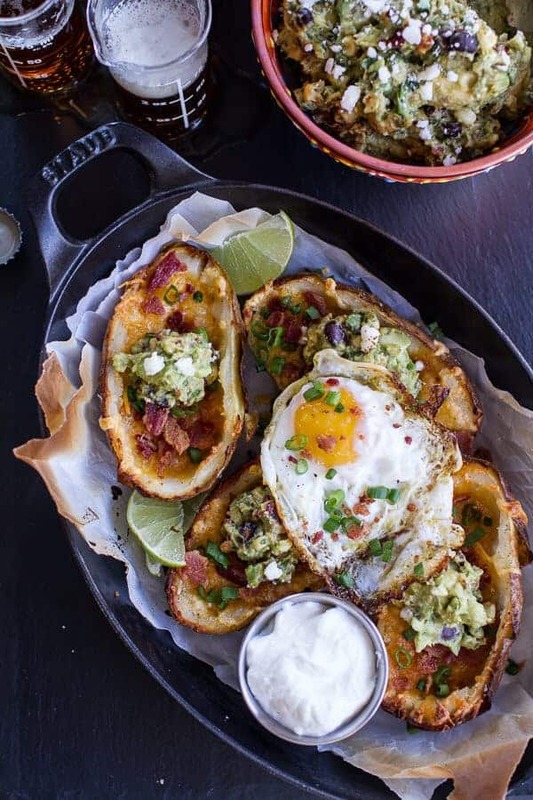 There is an egg and bacon and potatoes sounds like breakfast….I have never made potato skins this is going to have to change soon. Sounds delicious! Any ideas for the leftover potato middles? Hey Lori!! I either make a pan of cheesy potatoes, mashed potatoes or last time I actually just roasted them with olive oil, salt and pepper. 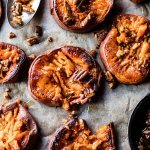 Perfect side dish! It looks sooooooooooo good! Definitely goin to try it. And the photos stunning! 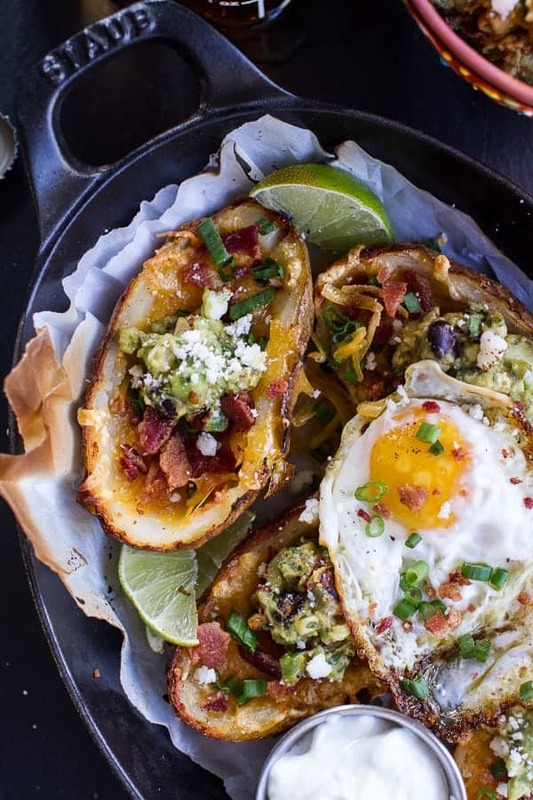 Wow – now that’s a loaded potato and I love the added egg! 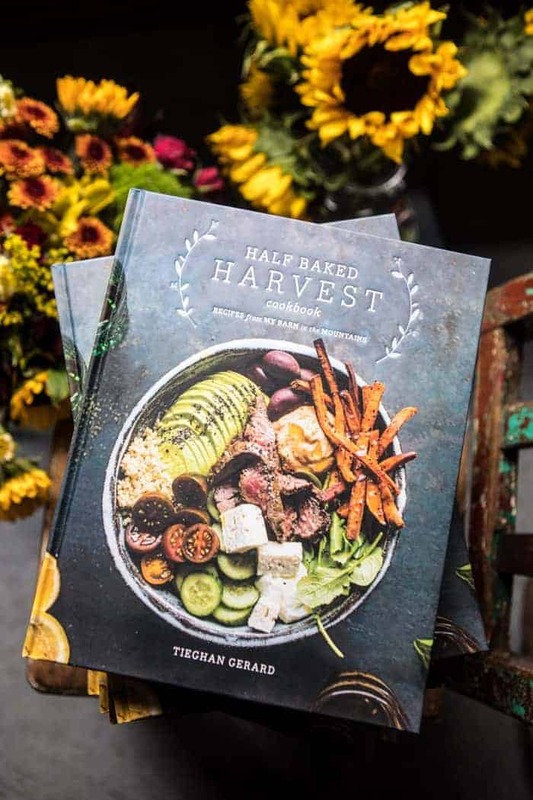 This would be a meal for me – can’t wait to try these Tieghan! My mouth is already watering. These look SO good. The fried egg and guacamole on top just pushes it over the line to absolute amazingness!! Haha! It’s Staub, I LOVE it! 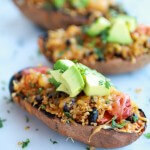 This recipe looks so indulgent and the perfect snack/meal for the Super Bowl weekend! 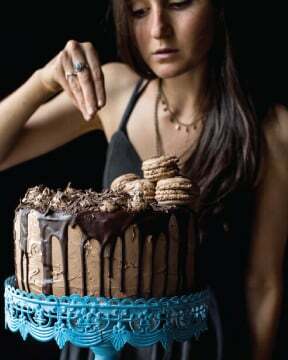 I’ve been trying to decide what to make and these are now at the top of my list! Awesome job, Tieghan! I don’t blame y’all for eating these as a meal – wow – a meal on a skin! OMG, Tieghan. These look AMAZING. Anything with the words “loaded” and “guacamole” have me hook, line, and sinker. 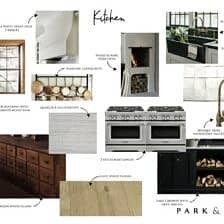 I know what I’m making this weekend! Once you top any side with an egg, you automatically have a meal in my book! These look great! 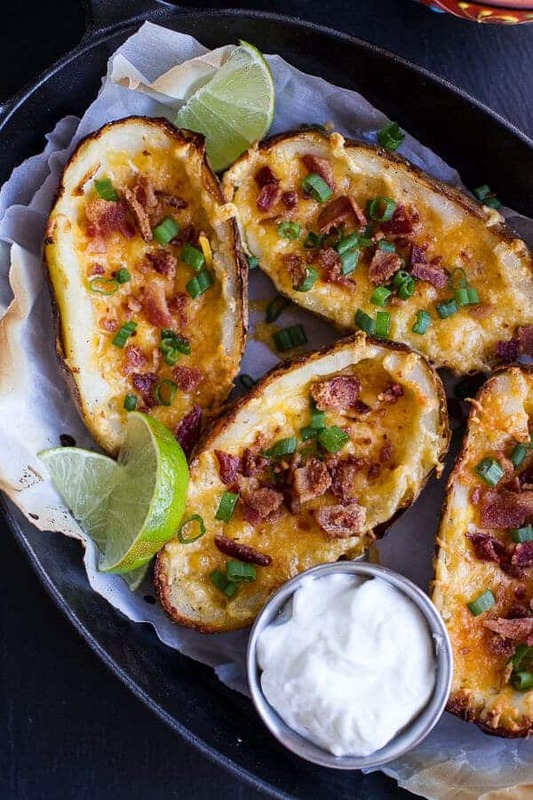 Loaded potatoes! Gosh, it’s so good. Thanks for reminding us of this deliciousness! I think you’ve put every imaginable topping on these, Tieghan! They look killer amazing! Your food is loaded with colours..
Colourful and positevely NOT AT ALL shy food. So excited you are enjoy my blog! Hope you have had a great week! I mean, I’m all about cheesy potatoes, but that guacamole is singing my song! It looks so good! I could probably just eat a bowl of that with chips and call it dinner any day! Yes please, cheesy potatoes are the best. 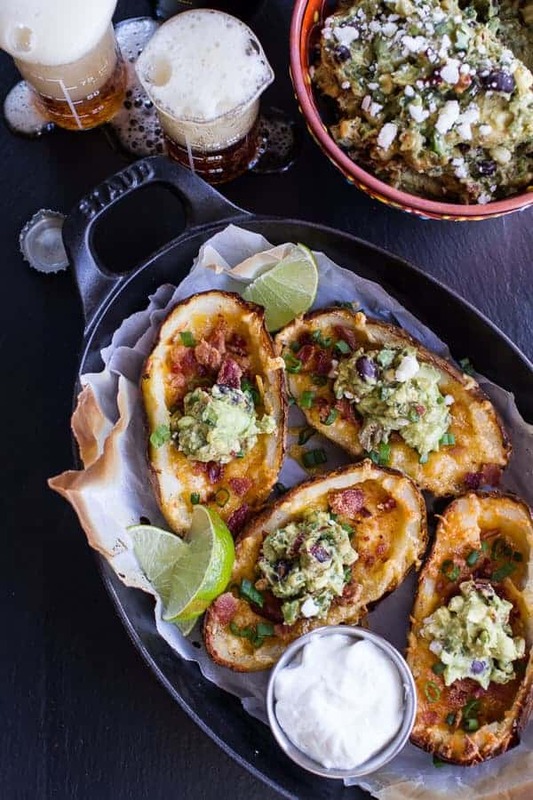 These potato skins are perfect for game day! Dear GOD! Tieghan, these look absolutely unreal. YUM! 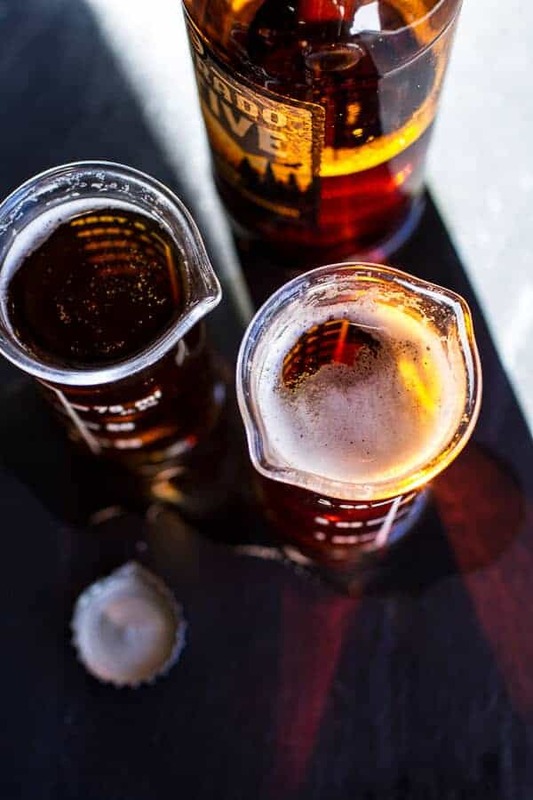 Also, those are the cutest beer glasses ever! Oh my gosh yes… I used to make these as a little tucker. I forgot about them until now and oh boy… they’ve never looked better. Butter, salt and cheese – those are three of the four food groups, right? 😉 These are stunning. But if I make them, do I have to share? Okay, you are clearly the person I need to be watching the football game with! I would gobble these up during the game! 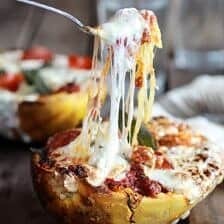 These look amazing it almost hurts to look at all that cheese!